The Kohl’s Art Generation Lab—part of the new Kohl’s Education Center, which opened February 25, 2012—is the Museum’s new “technology room” for kids and families. 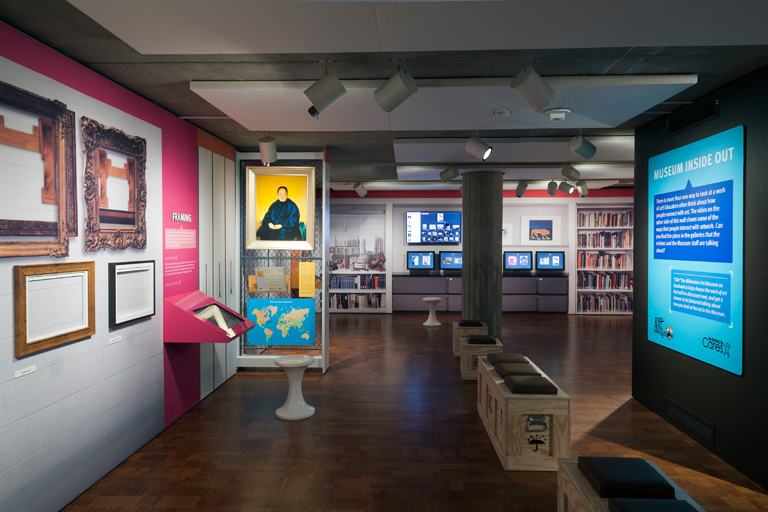 It features an exhibition entitled Museum Inside Out, which takes visitors on a behind-the-scenes tour of different departments at the Museum through high-tech interactives (and some low-tech ones, too). Kids and families can X-ray a painting, choose the frame for a work of art, and “Ask a Curator” their art-related questions. The Kohl’s Art Generation Lab is open during normal Museum hours through August 31, 2013. One of the higher-tech attractions in the Lab is the Museum’s voting interactive. 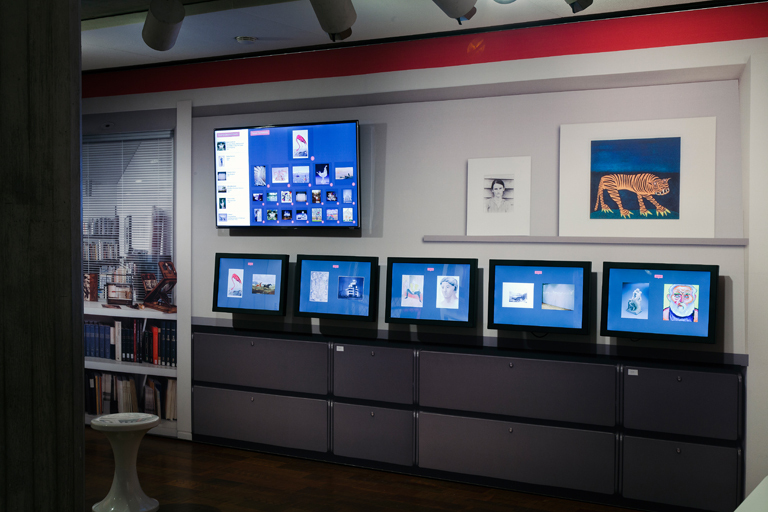 Five touch-screen monitors each randomly display two artworks side by side; the visitor is instructed to “tap to vote” for his or her favorite work between the two. Upon each selection, the information is collected, the results are tabulated, and two new works are displayed. A larger “leaderboard” screen above the touch-screens displays the current top 20 works in the contest, along with a list of recently selected works. We started out not knowing how many votes to expect, and we were pretty surprised by the results. We did some mental math: “Let’s see… the exhibition will be open a total of 18 months, and we can expect maybe a thousand votes a month, so a good goal is maybe 18,000 total votes, right?” The interactive designer on this project, Brent Gustafson of Minneapolis, shared a story about how he worked with the Walker Art Museum on a similar project: They had expected only a few thousand votes and were shocked to discover they ended up with over 120,000 votes. That was the Walker, though, and that was Minneapolis. As of this posting, the Kohl’s Art Generation Lab has been open five months. We have seen not one thousand votes per month, but an incredible one thousand votes per day, on average, bringing the total number of votes to over 150,000—with thirteen months to go before the exhibition closes. So what does this mean, “150,000 votes”? The reader might imagine class after class of fourth graders speed-tapping the touch screens, frantically vying for some imaginary high score. In actuality, the attendance numbers indicate a far more balanced (and thoughtful) approach. According to data reports generated by a heat-sensing visitor counter installed near the room’s entrance—this is our technology lab, after all—an average of 350 people have visited the Lab each day. Some days we see lower attendance numbers, some days greater, but the end result is an average of three votes per visitor. And, “three votes per visitor” translates to 150,000 votes in five months. Perhaps even more interesting is an examination of how these votes have been distributed among the 186 artworks in the queue. “Total votes divided by total artworks” gives us an average of 806 total votes per artwork; each artwork, on average, has received somewhere between five and six votes per day. Each artwork has not received the same number of votes, though—there has to be a first place and a last place. In fact, with 150,000 total votes, one might think the contest is essentially over: How does my one vote stack up against 150,000? It turns out that one vote still makes quite a difference in this contest. As of right now—five months and 150,000 votes into the exhibition—only two votes separates first and second place; another two votes separates third and fourth place; one vote separates fifth and sixth place, and so on. Surprisingly often, a single vote bumps an artwork from first place into second. You can see the total votes for each artwork when you tap on it to vote. The leaderboard truly changes every day. In 2013, the Milwaukee Art Museum will highlight the top 20 works in the Collection based on the results of the voting interactive in the Kohl’s Art Generation Lab. Although the exhibition will be open until August 31, 2013, you’ll need to get your votes in by December 1, 2012, for them to be counted in the highlighted results. -Jonas Wittke, Kohl’s Art Generation Community Relations Director, oversees all aspects of the Kohl’s Art Generation program, a partnership between the Milwaukee Art Museum and Kohl’s Department Stores based on $4.3 million in gifts from Kohl’s Cares. This entry was posted in Behind the Scenes, Education and tagged Kohl's Art Generation, Kohl's Art Generation Lab, Math, Technology. Bookmark the permalink. Power to the people, JW. For the art, for the kids, for the families. Question for the kids 12 and under: does your art change when its hot out? Do you like the same colors or does it make you change your palette?